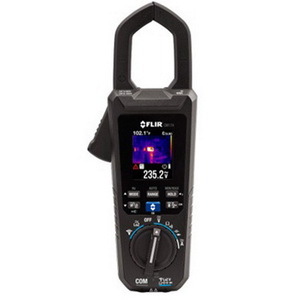 Catch issues you probably would have missed without a visual image with the FLIR CM174 Clamp Meter. Check for hazards to make sure its safe enough to make contact and use the laser to help pinpoint the problem the thermal imager shows you. This device helps you find and solve electrical issues fast. It fits in your pocket and its narrow jaw and built-in worklight helps you access difficult locations with lighting issues. This new and faster way to see what you are clamping on to will help you troubleshoot problems and verify your repairs.